What is hail made of ? Hailstone : Ice particle with a diameter generally between 5 and 50mm, some of them can reach 15cm. How does hail form ? Hail forms in tall clouds as cumulonimbi. Ideal conditions for hail formation are very high clouds with intense updrafts, containing a large quantity of supercooled water (liquid water under 0°C) and with dust particles in the atmosphere. At the very beginning, a hailstone is a supercooled droplet which freezes by melting with condensation nuclei (as a dust particle). 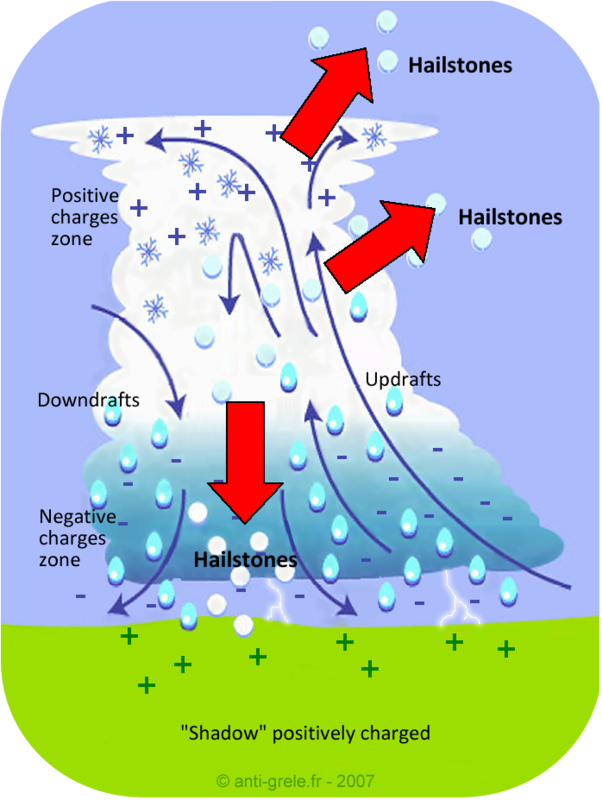 The hailstone nuclei is lifted on the top of the cumulonimbus by the strong updrafts. Once situated on the upper part of the cloud, the hailstone falls down and is lifted again. Each time the hailstone goes through an area with a lot of supercooled water, it grows in size and increases in weight. Once it becomes too heavy, the hailstone is either ejected from the top of the cloud (because of the intertia) or falls from the bottom (because of gravity). Damages due to hail storms. Hail is destructive to cars, crops, greenhouses, etc… But the largest hailstones are dangerous not only for fixed objects but also to human and animal life. In very rare cases, hail storms have killed both animal and people. The most destructive hail storms typically occured in high altitude, montainous regions such as Northern India, Bangladesh, Mexico, Argentina and various parts of the USA and Canada. What is freezing rain ? The phrase “freezing rain” refers to any precipitation that reaches the surface in liquid form and then freezes on the ground. Difference between hail and ice pellets ? Ice pellets (“sleet” in US) are formed by water drops which leave the cloud in liquid form and freeze by going through an air layer whose temperature is under 0°C before reaching the ground. In many cases, ice pellets are smaller than hailstones but this kind of precipitation can also cause damages. 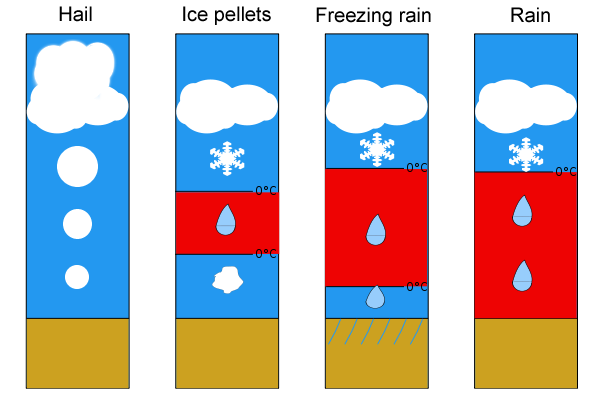 In Canada, ice pellets are most commonly the primary form. It refers to a precipitation of ice granules which occur between snow and freezing rain. In France and in Western European countries, the phrase “ice pellets” is commonly used to describe the secondary type. It refers to supercooled droplets which melt before hitting the ground if the condensation level is high. If this level is very close to the ground these granules will fall in precipitation. That’s why european growers generally encounter this phenomenon during Springtime and Autumn.